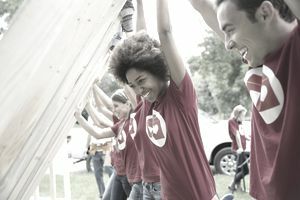 Those who choose to volunteer are given unique opportunities to develop leadership, communication, interpersonal, organizational skills, etc. In addition, volunteering creates a sense of personal fulfillment and accomplishment not usually achieved in a typical work environment as well as offering the many personal rewards that occur when one decides to make a positive contribution in the lives of others. Although volunteers exist in all age groups, the number of young people in recent years interested in contributing and finding ways to give back has increased tremendously. The relief efforts of numerous groups of college students that have continued since the disaster of Hurricane Katrina is a good example of the valuable contributions young people are making in helping our nation and its’ people during times of need and there has been an increase in the overall number of college student volunteers since the attacks of 9/11. There are a tremendous number of opportunities where students and new graduates can make themselves available and assist struggling groups and communities. Listed below is just a sample of the types of organizations that exist. Be sure to check for agencies and projects in local communities and for issues that are affecting local citizens in addition to all of the national and international organization that offer thousands of volunteer, internship, and job experiences to people around the world. The Corporation for National and Community Service was created to bring together Americans from all across the country and provide them with a way to give back to their individual communities and nation. It is an independent federal agency that accepts volunteers of all ages and backgrounds and encourages citizenship, service, and responsibility among those who serve. It includes programs, such as: Senior Corps and AmeriCorps is America’s largest grant maker supporting local, national service and volunteer programs. Action Without Borders (AWB) is a nonprofit organization with offices in New York, Portland, Washington DC, and Buenos Aires. Thousands of opportunities for volunteers, interns, consultants, etc., exist on their website, Idealist.org. Many college students have offered their expertise and services over the years immediately following graduation and before landing their first job. World Teach offers opportunities to live and work in another culture while assisting children in an academic setting, The South Africa Summer Program is one of the exciting opportunities available. In addition to the national and international organizations and programs available, local communities have nonprofit organizations and/or agencies that are always in need of volunteers. You can check with your local Chamber of Commerce or newspaper to create your own list of organizations needing help and assistance. Many part-time and full-time opportunities exist for finding ways to give back and assist local people in need. You can also find many more opportunities, locally and nationally, through the various nonprofit and charitable organization websites.